Despite a recent vote, America's largest mathematical society lacks individual recognition. Alexandre Grothendieck is arguably the most important mathematician of the 20th century, but he has been willfully missing for the last fourteen years. Unverified accounts have him flitting about the Pyrenees or gardening in southern France, but the inheritors of his groundbreaking work in algebraic geometry can’t be sure that any of these explanations are true. “He is still alive, we believe,” says Susan Friedlander, a mathematics professor at the University of Illinois at Chicago. If so, Grothendieck would be 78 years old; but the most current pictures available show a lean, middle-aged, bald man of monkish serenity. The reason for Grothendieck’s retreat is less mysterious. In 1988, after refusing to accept the highly prestigious and lucrative Crafoord prize from the Royal Swedish Academy of Sciences, Grothendieck released a letter to multiple newspapers and scientific journals condemning what he called the politicization of the scientific community. Prizes and awards were changing the spirit and goals of mathematics, sometimes resulting in blatant intellectual theft, he said. At the end of his letter, Grothendieck predicted a complete unraveling of the scientific establishment. In fact, he was so dedicated to the purity of mathematics that he eventually refused to practice it in a system that he considered tainted. Four years after the letter was published, not even his family could locate him. In the years before he vanished, Grothendieck became a passionate spokesman about the danger of further tethering science to politics, and his writing gave voice to a philosophy that most mathematicians still extol, but many consider to be rapidly eroding. “Mathematicians like to think they are egalitarian…whether they behave that way is another matter,” explains James Arthur of the Clay Mathematics Institute. Last November, the American Mathematical Society nearly took one step closer to realizing Grothendieck’s nightmare when it voted on a proposal to establish a fellows program among its members. With 62.3 percent of voters in favor, the measure barely failed to collect the two-thirds majority needed to pass. Had the program been enacted, the AMS would have been the first mathematical organization in the United States to impose a ranking system on its community, and many speculate that the two other American societies would be compelled to follow suit. 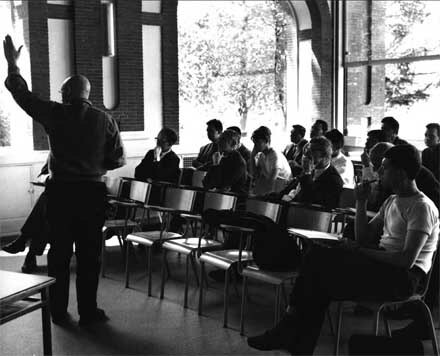 The AMS is the oldest and largest mathematical society, with more than 30,000 members spanning all ages, from retired professors to undergraduate freshmen. Although each pays a membership fee, only five percent would be elected as fellows under the proposed program. Opponents of the proposal are so fiercely protective of their ideals that it took five years of debate before leaders of the AMS could even agree to allow a general vote. Throughout it all, some members have threatened to resign if the vote passed. “The vehemence with which the people who were against it expressed themselves gave pause,” says James Arthur, who is the current president of the society. Proponents, however, have not backed down. They argue that leading American mathematicians would receive more funding and public attention if they were designated as fellows. Mathematics societies are among the last scientific organizations to not honor their members in this way. Physicists, engineers, and chemists all have fellows programs. Apart from winning highly competitive awards, there are relatively few ways for American mathematicians to distinguish themselves to universities. That is precisely the problem, according to Friedlander. She finds that mathematicians have a harder time securing academic posts than scientists who have been formally recognized by their peers. “I have noticed within my own university that mathematicians in competition with chemists have been at a disadvantage,” she says. She describes the program as “a way of giving a little gold star to people” and argues that, while the title would amount to little more than a pat on the back within the society, it could result in better jobs at universities. Installing a fellows program could also provide mathematicians with a much-needed platform from which to communicate their goals and advances to the public, drawing fresh interest to the field. Mathematicians have gained a cultural reputation for being an especially aloof and introverted crowd that sound like they’re speaking in tongues. Many extreme personalities over the years have added to this perception. While some in the field are proud of their eccentric image, most recognize a need to be more accessible to the public. Although the proposal fell short in November, Friedlander is confident that the AMS will continue to discuss it. But opponents of the measure have a hard time believing that it even made it this far. “I expected it to go down in flames,” says David Eisenbud, a former president of the society who teaches mathematics at UC Berkeley. Eisenbud and others are deeply protective of the truth-driven priorities that they say separate mathematics from many other scientific communities. Mathematicians inherit a culture that puts knowledge first and recognition second, they add. This is evident in the way mathematicians list authors on joint papers in alphabetical order rather than the magnitude of their contribution– a tradition that other scientific disciplines don’t share. Eisenbud worries that an award system would chip away at a culture of open intellectual exchange while sowing feelings of resentment among a group that tends to communicate as equals. “This sort of thing fumes and sputters and poisons the atmosphere for years,” he says. Some members of the AMS predict even more dire consequences: they think that a fellows program would actually deteriorate the quality of work among its members by embroiling them in political negotiations. Michael Reeken, a mathematics professor at the University of Wuppertal, insists that it’s impossible to do good mathematics while being politically active. Fellows in the proposed program would have to spend a certain amount of time during each year nominating candidates and electing new fellows, and even that is too much time for someone trying to do great work, he argues. Of course, accepting the honor would not be mandatory, and mathematical purists such as Reeken will always exist, no matter how the society changes. Friedlander says she plans on raising the issue again in 2007 and feels confident, given the majority vote this year, that the AMS will soon have a fellows program. While it’s unlikely that they would follow Grothendieck’s retreat into the mountains, Reeken and others have guaranteed their resignation from the society if the measure gets pushed into existence.